I have returned from Maine, and think I have had a quite profitable journey, chiefly from associating with an intelligent Indian. Having returned I flatter myself that the world appears in some respect a little larger, and not as usual smaller and shallower for having extended my range. I have made a short excursion into the new world which the Indian dwells in or is. He begins where we leave off. . . The Indian who can find his way so wonderfully in the woods possesses so much intelligence which the white man does not — and it increases my own capacity as well as faith to observe it. I rejoice to find that intelligence flows in other channels than I know. Winter is in and over us here in Gloucester, and I sit in my book-lined study that smells of the wood from the bookcases and of the paper from the 19th century volumes of Emerson and Thoreau, my old town histories, mildew of the pages. The room is imbued with my sweat, the sweat of almost four years of work in fits and starts on stories, novels, essays, letters to editors of newspapers. The drawers are filled with pages of words, and the place smells of me and whatever labor or toil I've exacted from myself here. So did Wayne's attic on Indian Island after a while, and the room at the Anchorage Motel in Old Town, our bedroom on Gotts Island, and the reading rooms in the libraries of all the places I've lived in or visited while working on this book. I suspect I've left quite an olfactory spore behind me, however ephemeral. And winter is in and over us, as it is on Indian Island. Nights are 35 degrees below zero, if this winter is anything like the last, and a lot of people will be cold down there: even in mid-September they were starting to button up all over. I miss my friends on Indian Island. By my last visit I could start at the bridge and begin to walk up Center Street, past church and rectory, past shops and houses, past the Lovarama Laundromat. Robby Troy Francis would tag along after me, and Burnell would sweep in beside me on his bike; Eva would nod and sometimes smile; Stanley Neptune and Kathy Paul would flash by in the open silver-gray Ford with Connecticut plates, the dog Tracy in the back seat. I'd say hi to Sammy and Jim, Bengun and Leo: Vickie and Ellen would wave at me from the Project Mainstream office, while Ken and Jim would be bent over their latest proposal or report. People I knew would wave or say hello and the people I didn't would nod. Almost everyone would acknowledge me as they don't fleeting tourists and out-of-staters who stray onto the Island, one of whom I was when I drove onto the Island myself on that first gray afternoon of May 7, 1971, trees still stripped and bare in places, as spring does come late in the north. It made me so happy, that walk, gave me the feeling — or was it an illusion? — of belonging, if only briefly, to someone else's world. Like the day I talked with Sister Celestine and she seemed a bit stiff and nervous at first and I was sweating and I hoped she noticed it because I didn't want her to think I was putting her through the third degree. We began to relax and talk finally and I was very much at home in the school library — the place in the world I'm most at home in — and I was thinking of how I'd just like to sit there all afternoon long and write my book there (and I did, a few pages in my notebook). Then Sister and I got going on the people and she told me how much she loved Senabeh and Mike Ranco and how much she thought of Sipsis and Jim and about what she saw as the Penobscot's "problem of identity," and we quipped about "Indian time" and how the people were attached to the land and the seasons and got that faraway look in the eye, the restlessness in the bones, in autumn — ah Kimskasoldin! — during the hunting season and how wonderful it would be if you could use all that instinct in teaching. That was mid-September and already the leaves were turning; we had had our first decidedly chilly night. Wayne put the heat on, and Terri with eight-month-old Jason sitting bolt upright in her lap and I and Wayne ate Terri's homemade peanut butter cookies (which Terri made after I told her my wife baked every Saturday night and its being Saturday night made me homesick) and flicked back and forth between "Championship Wrestling" and Frankenstein's (Maine is spacey) country and western talent extravaganza on TV. The leaves were turning and the next morning I left for Gloucester taking with me as far as Route 495 in Massachusetts Timmy Love, one of the first Penobscots I had met in May, and his girl Jo. When I met Timmy he was a drop-out (a push-out, really) from Old Town High; and when I came back in September he had returned to the Island with a proposal establishing a free school or street academy for dropouts right on the Island, teaching everything from the native languages and culture to auto mechanics. So in one sense my taking Tim and Jo away with me — he was the Indian I talked to most on my first trip; he'd conducted me painstakingly over every inch of the Island, telling me who lived in each house, and the name of each street and place — brought one part of my experience full circle. Surely a circle of no large circumference topologically, though I have learned to respect all circles, indeed to begin to think in circles, as Indians do (and live in) and as Black Elk says the white man has no respect for. Now winter has the island in his grip, the old Ice God has loosed his cold breath on the Panawapskik and Olson Isle on the margins of the river and in the earth of Oak Hill burial ground, where in their ocher beds the ashes of the first people of the New World, the Red Paint Indians, ancestors of Martin and Tim, Eve and Earleen, lie in cold dust. Yes, winter, and I wonder if Bengun and Senabeh have enough to eat and a tight roof and where Bengun is living now. I wonder who has dropped out of school and who has been pushed out. I wonder who will go to Southeast Asia and die there and who will come back and live again on the Island, and who will leave and never go back again. Finally, as I bring to a close these scarcely complete and surely imperfect pages, I regret all the things I have left out, all the people I might have spoken with had I been perhaps more persistent, bolder; the lives I might have made clear for the reader, the homes I might have described, the stories I might have retold. I keep saying to myself, "If I could only begin all over again, have the year allotted me once more, I could put so many more things in these pages." But I'm through, I'm abandoning the book; the pages will be off soon to Boston. Mark's photographs are already in production. 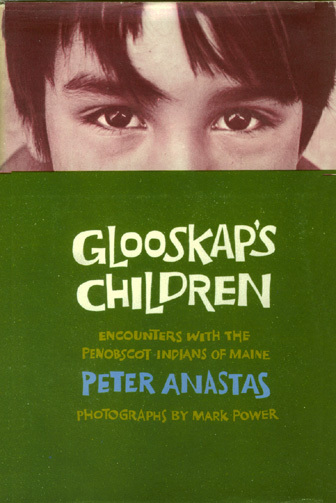 You might think I would beg the reader's indulgence, announce a companion volume — Glooskap's Children Revisited; Further Conversations with Senabeh. No, I shan't write again about my friends whose friendship and patience, whose understanding and hospitality I have doubtless abused in these pages. All the things I could have done I won't do, but I hope they won't remain undone. I hope the next book you read about my friends will be written by one or several of them. I hope the younger people will persuade their grandparents, their parents, and their aunts and uncles to tell all those stories which need to be told directly to Indians and not to white men if only because the world has such need of them. I wish Norris would write or tell his life story: I hope Suzy Dana will live a little longer and do more than simply utter a vocabulary to a visiting ethnologist, even though that vocabulary's loss will be a nation's loss. I hope that Tim will come back and be a teacher, and that the virtue of Senabeh's medicine and his living presence on the Island will not be lost. I hope Mike gets that degree, even though he and I both know he really doesn't need it. I hope Wayne and Terri, Martin and Kathy can overcome the difficulties of an honorable but regrettable poverty, and the deeper ones of inevitable marital crisis (as I have not been able to); bringing up children, somehow, to live in a sick and demented culture, in a world on the brink of destruction. I hope the babies born during the tragedy of Vietnam will grow up to be Indians first because they will be better Americans for it. I hope, finally, and with all my heart that someone on the Island, some one of Glooskap's children, will find a way of mastering all that knowledge and wisdom buried for thousands of years, which all humans need to know again if we are to survive, and which for centuries they have tried to beat out of Indians only to destroy that wisdom and scatter the bones which house all that great spirit. They tell the story that just as he came mysteriously out of the East and the rising sun one day and made their world, the trees and flowers and the animals and all his children, Glooskap did, he left melting into the sunset in the West — but not before promising to come back and help his children in their time of greatest need. He said he would help them throw off their burdens, drive their oppressors from their lands, and make them happy and prosperous again. Glooskap, according to some people, meant "Liar," and he also had white skin. Yet, according to others, Glooskap, or Klos-kur-beh, also means "The Man from Nothing," simply, He Who Came Out of the Void. He did vanish into the West, but he left behind the Penobscot people, his own children who had children of their own. So Glooskap remains in those children, and in them he has sewn the seeds of their own liberation, for it is just possible that far from being "overwhelmed" by those we have oppressed, we will be liberated by them as they liberate themselves. Me hear how some say world all burn some day, water all boil all fire; some good ones be taken up in good heavens, but me dunno — me just hear that. Only hear so. World all gone. Dunno how quick — mebbe long time; all be dead then, mebbe; guess it will be long time. Copyright 1973 ; 216 pp.